Blossom PinThis is a child theme of Blossom Pin Free WordPress Theme. The theme helps you easily create a Pinterest like website in no time without writing a single line of code. Blossom PinThis features infinite scrolling feature on a beautiful feminine design. 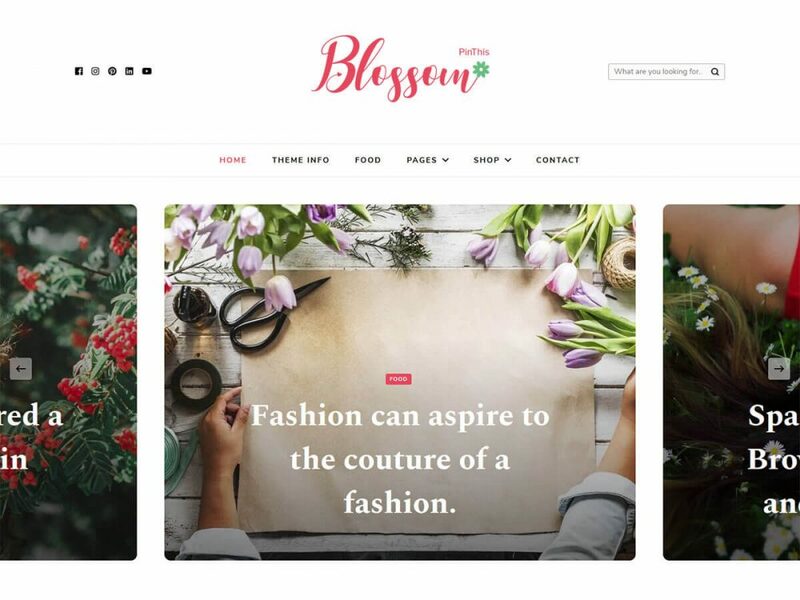 Blossom PinThis helps you quickly create a personal blogging website and dominate your niche with mobile-friendly, SEO ready, and Speed Optimized code. The theme also helps you increase your revenue with an online shop and advertisement widget. Fashion Blog – Write about the latest fashion trends and become a fashion icon by starting a fashion blog with Blossom PinThis. Lifestyle Blog – Do you know the way of life that can help people? Why not start a lifestyle blog? Journal Blog – Keep an online journal of your life experience easily with Blossom PinThis. Travel Blog – Live a nomad lifestyle by writing and monetizing your travel experience with this free WordPress theme. Beauty Blog – Help your readers stay beautiful by sharing makeup tips with beautiful Blossom PinThis WordPress theme. Mom Blog – Know the ups and downs of becoming a mom? Start a mom blog! Food Blog – Explore foods and share your own recipe today without any hassle. You can change the primary color of the theme with a click from the intuitive theme panel of Blossom PinThis. The number of people who surf the Internet on mobile phones has increased exponentially– according to stats, more than 50% of Google searches are done on phones. So, your website must be responsive to the screen sizes. Also, Google boosts the ranking of websites that are mobile friendly. With Blossom PinThis, your blog will display beautifully, without breaking, on every device. The theme adjusts itself to the screen size so that your visitors can get a smooth user experience and Google can rank you higher. Blossom PinThis passes Google’s mobile-friendly test. We have made changing the font of the theme easy on Blossom PinThis Free WordPress theme. You can select the font that suits your brand from 600+ Google fonts. You can flaunt your Instagram profile on the homepage of your blog with Blossom PinThis. The attractive Instagram section helps you grow your social media influence. You can build trust with your audience by displaying your bio on the sidebar of your website. Blossom PinThis comes with a widget that helps you easily introduce yourself to your visitors. Having a strong social presence is essential for the growth of any blog, so you should be able to showcase your social platforms on your website. Blossom PinThis helps you display your Instagram, SnapChat, Twitter, Facebook, and/or Pinterest profile on your website using intuitive widgets. You can easily add subscription form on the sidebar of your blog and grow your email list. The theme also comes with a strategically placed newsletter section. Blossom PinThis is an ultra SEO optimized theme. How is it ultra? Because, on the top of basic SEO, we have integrated Scheme Markup on the theme. Scheme.org ready code helps Google understand your blog better and thus rank you higher. You can easily beat your competitors on search engines with Blossom PinThis. You can show the updated date of your post on Blossom PinThis. This simple feature will help you establish trust with your audience and search engines. With Last Updated Post Date, you can let users and Google know that you keep your posts up-to-date. Blossom PinThis rocks infinite scroll pagination. With infinite scroll, your audience can browse all your posts without reloading the page. This Pinterest like feature will increase user engagement of your website. We know that Google and users prefer a fast website, so we made Blossom PinThis in such a way that your visitors will not experience any lag. Studies also show that even a second makes a difference when it comes to loading speed. Customers move to another website if they have to wait, so speed matters. With Blossom PinThis, you can rest assure on the performance of your website. Blossom PinThis supports Advertisement widget. This widget lets you add an ad code or a custom image with a link so that you can quickly monetize your blog. Blossom PinThis theme is fully compatible with WooCommerce plugin. You can create your products and sell them on your website, or you can create a highly effective affiliate marketing website with the combination of Blossom PinThis Free WordPress Theme and WooCommerce plugin. Blossom PinThis rocks an attractive slider on the banner section. You can choose from 2 different slider layout to display up to 20 latest posts or 20 posts from a particular category. Blossom PinThis allows you to add a full-width video or an image on the banner section. A video is a great way of engaging your audience on your website. Blossom PinThis comes with two header layouts. Choose the one that works great for your website. You can select a list layout or a masonry layout to display posts on the homepage. Blossom PinThis has two different styles for archive page. You can use the layout with small image or large image. With Blossom PinThis theme, you can display your posts and pages in three layouts– full width, left-sidebar, or right-sidebar. Blossom PinThis WordPress theme allows you to display your social media links on your website so that your visitors can find you on social media. Social media on your website will also help you boost your business’ engagement. The theme also supports Russian and Chinese social media like OK, VK, Xing, qq, and others. You can add unlimited social media on your website. Blossom PinThis WordPress theme comes with an extensive theme documentation to help you setup your website. Just follow the step by step guidelines on the documentation and your website will be ready in no time. Blossom PinThis has ample space for widgets. You can add and manage the widgets you require without compromising the design of the theme. Widget ready design and code allow you to easily customize your website as you desire. Blossom PinThis is cross-browser compatible, which means the theme will work seamlessly with the popular web browsers. The theme is tested on Chrome, Firefox, Internet Explorer, Edge, and Safari. With the perfect font type, size, spaces, and contrast, Blossom PinThis makes sure that your content is easy on the eye and your visitors enjoy reading what you have to say. Don’t let the language barrier come between you and your website. Blossom PinThis theme supports localization so that you can use the theme in your local language. Do you use right-to-left (RTL) scripts like Arabic? Well, worry not! Blossom PinThis supports both LTR and RTL languages. You can write content with confidence! You can easily add your own logo on your website using Blossom PinThis theme. Want to modify some CSS effects or change color of a section? Blossom PinThis allows you to easily add CSS effects right from the customizer.